“If we’re doing our job, the community will have lower divorce rates and higher credit scores,” says Greg Massey, CEO of First United Bank. To Massey, a bank is not just a place to safeguard deposits and make loans; banks can elevate the finances, zeitgeist, and emotional health of the communities they serve. It’s a philosophy that’s infused throughout the 42 branches of the Oklahoma-based bank, and it is so deeply ingrained that a drive-through teller in Paul’s Valley, Oklahoma, didn’t think twice when she encountered a customer in need. As she waited for the customer to present her transaction, the teller noticed the woman’s shallow, rapid breathing. Then the woman’s shoulders drooped, and her chest convulsed. A tear trailed the contours of her cheek as she fumbled with her purse. “Ma’am, are you okay?” the teller asked. This was not an isolated incident of empathy and concern, but the fruit of a mustard seed Greg planted, watered, and nourished until it became an integral aspect of business at each First United branch. As the teller later told Greg, she was happy she worked at a firm where she could bring her whole self to work. First United was the local bank in Greg’s hometown of Durant, Oklahoma (population about 16,000), that Greg’s father purchased in 1990 and persuaded him to help run. Greg left a job in Tulsa to return home, overseeing a dramatic growth spurt. Within 10 years, First United had grown from 40 employees and $800 million in assets to hundreds of employees and $2 billion in assets operating in 42 Oklahoma communities. “We’d lost the flavor of the organization,” Greg admits. That’s when a friend introduced Greg to Rand Stagen. Greg also started working with Stagen coach Rick Voirin. Greg’s work with Rick ignited a personal growth spurt. One of the first—and most counterintuitive—lessons Greg learned from Rick was that he had to slow down in order to speed up. 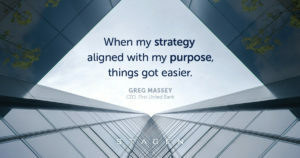 The lessons he was learning from Rick were reinforced when Greg went through the Stagen ILP—particularly the importance of personal development, purpose, and creating an environment of lifelong learning within the business that empowers every employee to contribute to the health and well-being of the organization. A firm believer in the value of the ILP, Greg has sent his entire executive team through the program. The value of the investment is readily apparent. Today, the bank holds $6.5 billion in assets and is growing at 15 percent a year. Most importantly, it operates as a group of community banks connected by common purpose and values. The banks are also connected by a common language, thanks to their Stagen work. Guided by their purpose and values, the branches focus on the unique needs of their employees, customers, and communities. Greg’s Stagen experience helped him to understand a hard truth: if he was serious about wanting to recapture what had made the bank so special when he first joined it, he was going to have to stop doing what had been successful in fueling the bank’s growth up to that point. The rewards are readily apparent. About two years ago, First United acquired a $2.5 billion Texas bank. Afterward, Greg called Rand and Rick, and said there’s no way the bank could have so smoothly made the purchase if not for the work he and his executive team had done through the Stagen Leadership Academy. Greg says First United’s purpose is to serve its varied communities and make a difference in people’s lives. One example of this commitment is the bank’s Spend Life Wisely program, which stems from its purpose and grew out of deep listening work with customers, who said they wanted a bank that would inform, educate, and help them do what’s right. The program includes free information relating to faith, personal development, and health and wellness. While some of those topics may seem far afield from a bank’s traditional concerns, Greg says they ultimately all tie in to the financial health of customers, the community, and the bank. First United’s commitment to customer well-being extends to basic financial literacy. For example, if a customer overdraws his or her account for a third time, the bank sends a link to get the customer onto the Spend Life Wisely website for tutorials on balancing a checkbook and creating budgets. Greg says that rather than focusing on transaction volume to fluff the bank’s bottom line, First United is dedicated to honoring the customer’s long-term interests. “That is a whole different frame from other organizations, and we recruit people who will have the heart of the customer and the community in mind, not one transaction,” Greg says. First United is currently remodeling all of its lobbies, and the purpose goes well beyond a fresh look. 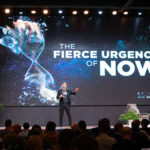 “It is about creating a flow that allows us collisions with our customers so that we can have deeper conversations, and through these, we actually have the possibility of helping people and meeting them where they are,” Massey says. Massey is not immune to these collisions. One day, as he was leaving the office, he was stopped by a customer. “I thought you were full of crap,” the customer said. “Well, I saw your commercial on TV and you said bring us your financial challenge because we want to help you,” the man shared. Greg paused in reflecting this story. “This is what it looks like when we go deep and get intentional with our purpose, values, and strategy and tie it all together with conscious leadership,” he says. Each community served by First United is unique, and Greg says the one-size-fits-all approach used by megabanks would not adequately serve the needs of First United’s customers. Greg says he is saddened by the short-term transactional business that banking has become. He believes the industry has lost sight of the health of the customers and communities it’s supposed to serve. If not for the fact that Greg honored his gut instinct that the bank wasn’t what it had been in the beginning, and then made a connection with the Stagen Leadership Academy, First United could be a typical bank with a short-term time horizon. Instead, it’s anchored in purpose and values. Every executive meeting at the bank begins with a reaffirmation of those principles—and closes with appreciations. Greg’s Stagen work doesn’t stay within the bounds of the bank. He collaborated with Choctaw Nation Chief Gary Batton—who’d gone through Stagen’s ILP as well—to build a much-needed Boys & Girls Club for the town. First United and the Choctaw Nation pledged $250,000 each for the project and inspired the community to invest another $250,000 to make the club a reality. Greg’s intentionality about improving the community led him to develop the Imagine Durant program, a community-based initiative to build and implement the community’s future. “We did more than three years of listening and then built a 40-year vision for our community,” he says. Greg’s involvement in efforts like Imagine Durant is personal. His office is down the street from the building where he was born. Greg pauses to reflect on what the Stagen Leadership Academy has made possible—for him, his bank, and his community.